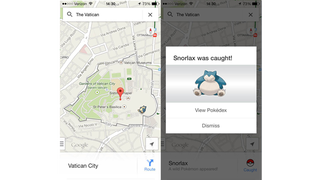 Today as part of an April Fool's prank, Google updated Google Maps for iOS and Android to include Pokémon. Let's try to find all of them! There are at least 150 Pokémon currently floating around on Google Maps. All you have to do is zoom in, tap on them and select "catch". Here are just a few I found. If you find one, take a screen cap or mention exactly where they are in the comments. Those are just a few of many Pokémon that are on Google Maps today. Together we can find them all. Search Google Maps, find them, and post your findings in the comments below.